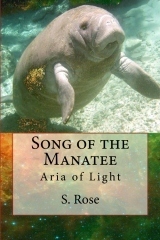 “Song of the Manatee: Aria of Light” by S. Rose is a beautiful science fiction novel. It has the charm of a young adult novel, amazing fantasy segments and thought-through science fiction. The setting for this novel is Florida of 2199, a world completely controlled by the central government through highly advanced technological control. Rose paints an original and detailed picture of this brave new world with some positive and some not so great advancements. The Black family is a loving, intelligent and conscientious unit, useful to the government but also a little suspect, not least due to the unconventional ‘natural’ conception of their daughter Swan. At the heart of the book is the disappearance of Michael Black, a palaeontologist, in the underwater caves, at the same time as his daughter Swan saw a space ship. Black’s research concerned the Florida Manatee, a benign but extinct species on Earth. After Black is gone, the government plays down the possibility of such a space ship but tries to manipulate the Black family to buy a particular property that might be the key to the disappearance and a sort of gateway. Swan is a wonderful protagonist, sweet and innocent in some ways, but very clever and powerful in others. On her fascinating journey through time and dimensions she meets some interesting characters and the search for her father takes on a deeper meaning for the future of the Earth. The scenes between her and Neb are wonderfully written, as are many others. To me the story shines through its winning combination of responsible ecological thinking, humanitarian values and beautiful magic within the context of a well written futuristic and science fiction story. Great characterisation and ornate scene setting contribute to the quality of the novel which uses a skilful blend of traditional sci-fi tools with magical fantasy writing. There are heart felt moments, inspiring scenes and entertaining ones, such as the ones with the estate agent charged with selling a property to the Blacks. The book leaves us with some questions that will need to be answered in the next part, which I eagerly await. The Kindle book will be on sale on Amazon for .99 cents from June 24th to June 30 only! Mark your calendars! Florida and manatees – favorite topics of mine. Great interview and post. You might probably enjoy S. Rose’s other book “Bridge Ices Before Road” which is more Literary Fiction. Thanks – I just downloaded it.